Hi-line Industries is unveiling the 2016 model of its best-selling Tundra refrigeration air dryer. The new models offer an energy-saving controller as standard, thus helping to deliver lower TCO (total cost of ownership) for customers, as well as increased reliability thanks to a redesigned refrigerant system. Further enhancements include design simplifications that have seen Hi-line remove pressure switches on smaller models and adopt more reliable temperature probes for control purposes. The 2016 Tundra range is expected to be even more appealing to potential users throughout industry, including workshop air and machine air in general manufacturing, as well as sectors such as packaging, textile, food, beverage, medical, dairy and automotive, to list but a few. The display of the multi-functional energy-saving controller provides information such as the dryer running dewpoint. Should the dryer go to light duty (i.e. reduced airflow) the refrigerant gas pressure is monitored and adjusted accordingly. The dryer has a built in energy-saving device which will stop the compressor and wait for the refrigerant gas pressure to rise to a pre-set value before restarting. This direct expansion technology not only reduces energy consumption but ensures at least +3°C PDP (pressure dewpoint) is maintained at all times. In contrast, some competitors of Hi-line are importing chilled mass refrigeration dryers that can be as high as +10°C in their thermal cycle, which is not suitable for drying air in northern European countries such as the UK. Further energy consumption advantages of the latest Tundra range are delivered as a result of the low pressure drop afforded by the modular, single cell aluminium heat exchanger, which gives the most efficient transfer of heat at the lowest energy cost. Additionally, the solenoid condensate drain is controlled from the dryer control panel to ensure efficient and reliable removal of water/condensate from the air. Tundra air dryers offer a 40-bar pressure range and can be provided with a range of high performance oil and particulate filters to suit dryer inlet and outlet ports. These filters are available in compressed air blue (RAL 5015) to match the dryers. Hi-line Industries currently holds around 700 Tundra air dryers in stock at its Midlands factory ready for next-day delivery. Models ranging from 21 to 1605 cfm capacity are stocked, although larger models up to 10,000 cfm are available to order. The company also stocks 60 Hz dryers for marine and offshore applications. 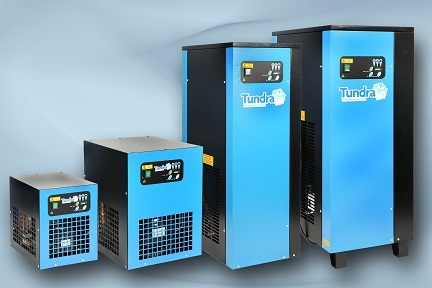 The latest Tundra refrigeration air dryers are sold through a nationwide distribution chain of air houses, compressor sales and service companies. Hi-line has a UK-wide team of service engineers providing industry-leading support to the company’s dryers, as well as other brands.